It takes millions of years for mountains to build up, and millions more to shed some of the looser and more fragile rocks, until what’s left is the strongest and most enduring part of the substrate. Everything else becomes valleys of alluvial soil. A relic is something that remains after everything else has gone. This show is made up of the remains of mountains and relics of their existence. The artist visited the territories represented, collected soil samples, and used these alluvial soils to dye and paint materials. For this exhibition, Amanda Agricola investigates mankind’s tendency towards the violent acquisition and demolition of land. She created CNCed maps of landscapes with precious resources and painful pasts. 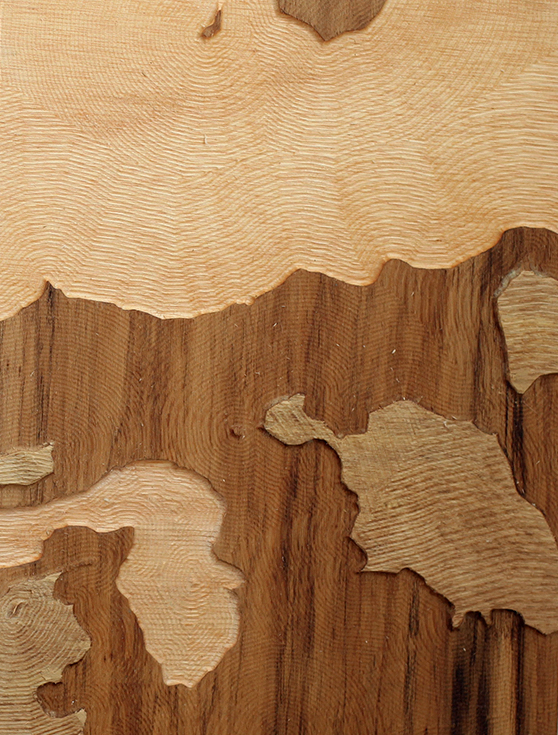 The CNC machine traces specific areas of the map, digging into the plywood revealing hidden layers within the wood. As it delves deeper into the wood, possible blemishes and flaws are revealed as well as hidden beauty in the grains beneath the surface of the ply. She imagines a future where there is nothing left to mine; these replicas of terrains with embedded cryptocurrency mining computers are all that are left. These works reflect on histories of colonization of lands caught in the crossfire of humans’ thirst for power, material possession, and resource development. Using dyes made from soils collected from these sites, she made earth prints that serve as palls that cover urns of lands scoured for resources, as if preparing the funerary rites of the earth. Texts, images, videos, and discoveries made on her journeys are digitally embedded in the palls and earth quilts. Viewers can explore this content in augmented reality by accessing the URL with a cell phone or IPad. The URL offers an alternative perspective, but it comes at a cost. The device begins to mine cryptocurrency while the URL is open; once again, reflecting on the relationship of the user and the used. About the artist: Amanda Agricola grew up in southern Appalachia, graduated with my B.A. in Studio Art from Hollins University in 2011 and received her M.F.A. from the Maryland Institute of Art (MICA) in 2015, graduating from the Mount Royal School of Art. She has shown her work locally, and regionally from from Maryland Art Place in Baltimore to Petzel Gallery in New York City.